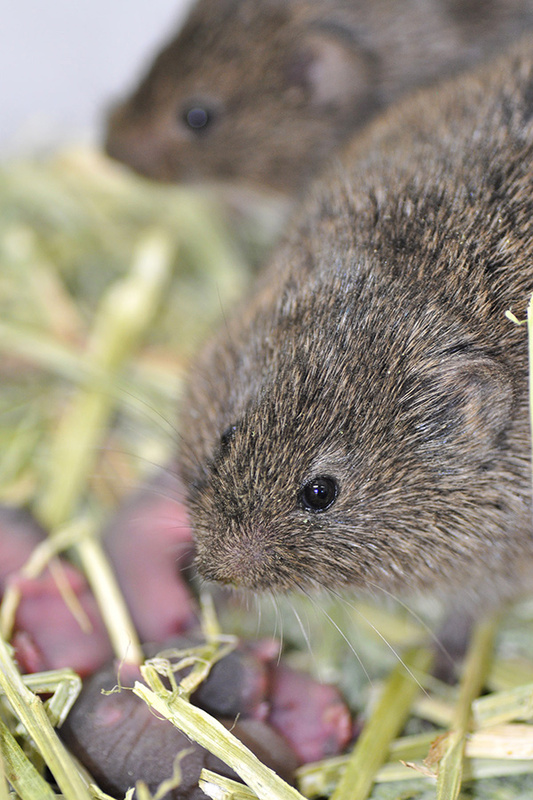 Prairie voles are known for monogamy and dads who care for their young. That's mom in the foreground. "It doesn’t count if you’re in a different zip code/time zone/country,right?" “Honey, I forgot we were married!" "Honey, I thought I was at our house!" The study, in this week's Science1 links subtle differences in a brain region associated with memory and spatial awareness to infidelity in the prairie vole. Even among these paragons of fidelity, however, some guys stray (is this sounding familiar?). Spreading their genes by fertilizing other "pastures" could confer an evolutionary advantage -- except that time away from home leaves his mate susceptible to other guys' blandishments. Straying "isn't exactly an advantage," says Steven Phelps, an associate professor of biology at the University of Texas, senior author of the new study. "The fitness of the faithful, and the not-faithful, on average, is exactly the same," defined as having more young. Both behaviors "stuck around because they are equally fit." To unravel the mechanism of fidelity and infidelity, Phelps and his colleagues looked at genetics, behavior, brain structure and hormones. The research focused on the hormone vasopressin which, in the body, affects kidney function and blood pressure. In the brain, vasopressin affects circuits related to memory and spatial awareness. The study focused on the retrosplenial cortex, which, in people, has "a wide range of cognitive functions including episodic memory, navigation, imagining future events and processing scenes more generally." In voles, Phelps says, "We know that males who have lower numbers of vasopressin receptors in the retrosplenial cortex are more likely to philander. And they have a different pattern of space use compared to other males; they spend more time on another's territory, and leave their mates unattended." The decision to stray seems "related to memory in some way," Phelps says, because the retrosplenial cortex is "important for navigation, for using contextual information to figure stuff out. These things are memory intensive." All that "cattin' around," of course, can produce what were once called "illegitimate" children. The question of vasopressin has been on Phelps's mind ever since the discovery of a wide range of vasopressin receptors in prairie voles. "I caught a bunch of prairie voles and counted receptors in the brain," he says, and found such a diversity that one expert suggested he had flubbed, mixing two species. Finding a difference "that was greater than what you'd see when looking at two species stuck with me," Phelps says. "I wondered whether the way we usually approach neuroscience, by looking at animals that are genetically inbred … was systematically excluding interesting questions about why all that variation was there." To evolutionary biologists, the ultimate explanation for behavior is reproductive fitness -- having more healthy offspring. But in the prairie vole, both the stay-at-homes and the wanderers are about equally fecund. So how did they evolve a genetic control that could, at various times, favor opposite tendencies? The answer may lie in the vole's boom-and-bust population cycle, which rises in the fall and falls during the spring, Phelps says. A high population density could favor males who stray, he says, because "It's harder to keep males out [of your territory] in close quarters." Because the opposite could apply during the low-population spring, having both behavioral patterns available could constitute an evolutionary advantage. The new science of epigenetics, which explains fine details of gene activation, could play a role in the shift from one behavior to another, Phelps adds, as genes switch on or off based on environmental conditions. Rodents usually get poor reviews, but the prairie vole, with its reputation for fidelity, has been a crowd pleaser. "Sometimes they may be too much like us," Phelps says. "When [co-author] Alex Ophir and I first found a fair amount of extra-pair paternity, I ended a talk with, ‘Perhaps the voles are a better model for human monogamy than we appreciated.'" But there's no sense going overboard with the analogy, Phelps says. 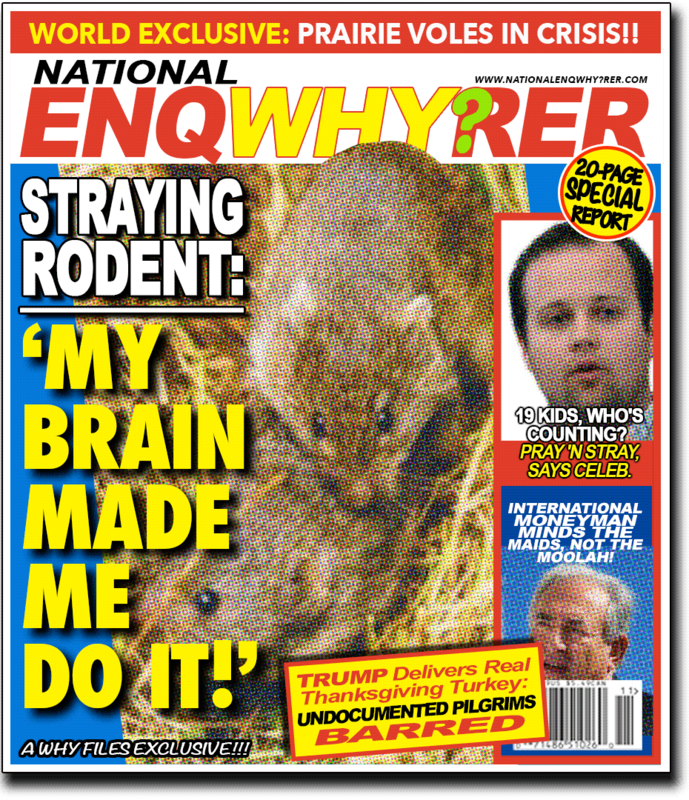 "I don’t look to rodents for moral guidance. It's not clear that our results tell us much about human monogamy, but they do tell us that individual differences might have been maintained by natural selection. Maybe we should not think about the brain as this singular thing. Departures from normal are not necessarily problems, disease. It would be useful to know what kind of variation is part of our healthy history."